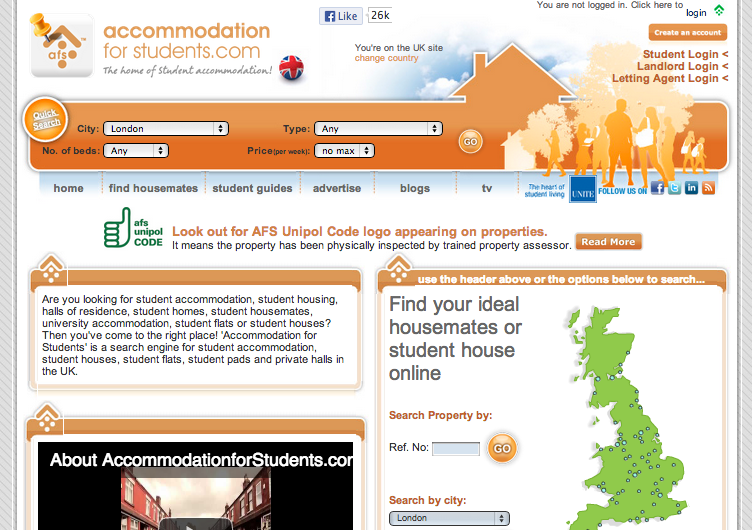 Accommodation for Students acts as a search engine for student accommodation, student houses, student flats, student pads and private halls in London and the UK. It allows you to enter type of property, number of beds, and location – so you can narrow down the perfect property for you. With other useful filters and checklists on every property, it makes the decision making easy. Accommodation for Students makes house searching easy – which is important – especially when many students will be doing it for the first time. With an easy to use website and useful tabs offering help, advice and information, finding that perfect property shouldn’t be too stressful. Go back to our Student Accommodation in London category to find other great websites offering accommodation solutions for students in London.